Honestly and truly, when the story first broke of the Carnival Triumph disaster and the conditions were described, my first thought was “this is how millions of people live around the world every day.” Where’s their breaking news? They don’t have the means to file lawsuits or the general recognition of their humanity by their governments for their deplorable plight to be acknowledged. It’s just as disgusting for them as for those passengers on the Triumph, though for them, there is no end in sight. No hot shower and soft bed waiting for them in a few days. If they die in those conditions, it won’t be on CNN. And certainly no one is going to compensate them $500 for their acute misfortune. Refugees from Myanmar live on the city garbage dump in Mae Sot, Thailand. Entire families have built make-shift shacks on top of the piles of refuse. These are their permanent dwellings. The quotes at the beginning of this article describe it perfectly. For a visual, watch this news clip on youtube. 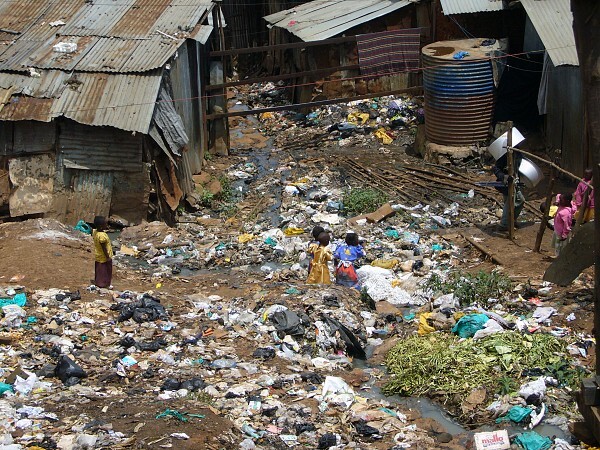 In Kibera slum, Nairobi, Kenya, thousands of residents defecate in plastic bags and leave them laying around because access to pit latrines is limited. There is nowhere else to “do it.” According to a resident “the waste produces a pungent smell, and when it rains, it floods our houses, and we are forced to move out. The lives of our children, too, are in danger because they play inside the filth.“ It’s been many years, but I’ve been to Kibera slum. And I’ve been in many other urban areas of Africa where slums like these are in abundance. But there we don’t call it a slum. It’s just how people live. Their neighborhood. Their town. Unsanitary, hot, humid, deplorable conditions. Carnival Cruises quickly acknowledged they had failed their clients in many regards. No one should have to vacation in those conditions. How about live in those conditions? The general population will forget about this ordeal in a few days, if they haven’t already. However, Carnival will continue to deal with lawsuits and the public relations mishaps. I suggest as a gesture of goodwill, acknowledging no one should be submitted to those conditions, much less their clients, Carnival match its $500 donated to each passenger to a non-governmental organization that supplies eco-friendly, sustainable toilet systems and wells in the most reviled conditions on the planet. I’m sure Matt Damon’s organization Water.org would gladly accept the funds on behalf of Carnival Cruises. And there you have the perfect marriage of two issues that have recently been in the news but will be gone from the public good conscience in about five seconds. I’ve been more and more convicted about this lately! There’s nothing standard about our “standard of living” in America. It’s definitely NOT the way most of the rest of the world lives. The problem: what does one DO about it? Thanks for the excellent article H! At least we can all agree living in sewage shouldn’t be the standard anywhere! What to do? I’m always tempted to say donate to a good cause/NGO/charity, but that seems like such a drop in the bucket. AWARENESS means nothing if it doesn’t spur someone in ACTION. I could say so many things about my response to the Carnival disaster. But, I’ll just leave it with what you wrote and make my only comment “WELL SAID”, H.
Thanks! I always appreciate your comments! Yeah, I noticed Nicolas Kristof had tweeted about this same idea a couple days ago. It immediately reminded me of Mae Sot (when did you go there? I was there during grad school in 2005 & 2006) and the slums on the edge of Dhaka or the outskirts of San Salvador right after the civil war in the 90’s. Or even here in Japan right after the earthquake two years ago when electricity was out in Sendai, and rolling blackouts were in place because a good fourth of the Tokyo area’s electricity was wiped out due to Fukushima. In the cold of winter, the people picked themselves up and rebuilt. My parents were just talking about a return trip back to Ghana and my dad mentioned the refugee camps spilling over from Ivory Coast. From what Ghana was when I was a kid it’s hard to imagine that they are now a safe harbor – how things change! I think that is a testimony to the fact that things can get better 🙂 Japan too – has rebuilt itself. Yet how quickly the news forgets…….. I love your idea of asking Carnival to donate to water.com! It’s a good proposal. 🙂 great blog H! I don’t follow Tweets, but if he’s famous and he tweeted it, maybe it will catch on! I haven’t been to Mae Sot, but having friends who have and just know about it from news, etc. I’ve been to plenty other “slums” though where people are just living their lives, day by day. Very thought-provoking and awareness-raising. We lived thru the floods here in Jakarta but we were not affected although we could see people suffering its consequences from our apartment building. On many instances I think how can people live like this? In the midst of trash and sewage. They keep throwing trash on the ground and that becomes the very problem that causes the flooding. This is not the first or even the 10th time this happens, it’s a constant every few months. But then again, as you say its their neighborhood and the way they live. I wish we could make a bigger difference than just donating a few supplies for them to start over…. Well done with this post. These are the thoughts that have been going through my head as well. Thanks Marilyn! I value your opinion! It seems many people “out there” are thinking about this too, though I haven’t seen anything in the media pointing out this stark reality. Not to diminish the experience of the Carnival voyagers – I’m sure it was completely horrific – but so are conditions in so many places!